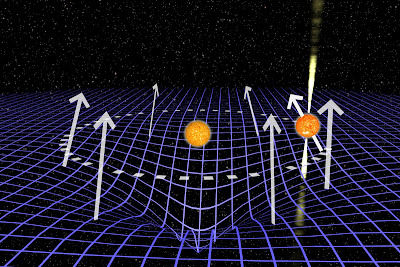 Scientists have measured the space-time warp in the gravity of binary pulsar system J1906 and determined the mass of its neutron star before the pulsar vanished from view. A binary pulsar system is comprised of a pulsar that is orbiting a binary companion which is usually a white dwarf or neutron star. In the case of Binary Pulsar J1906, the scientists have measured the solar mass of the accompanying neutron star to be 1.32 solar mass with a sphere only 10 kilometers (6.21 miles) across. J1906 is the youngest double neutron star system whose mass has been measured. The spin axis of the pulsar wobbles like a spinning top. Since the distance of the two neutron stars in J1906 is very close and each star weighs more than the Sun, the space-time between the stars is curved which affects the pulsar's spin axis. The wobble has been so much that the pulsar's beams no longer hit the Earth, making it disappear from sight. It is expected that the pulsar will be visible again in 160 years. A pulsar is a neutron star that formed when a massive star's core is compressed during a supernova. The supernova collapses the star's core and forms the neutron star. Pulsars are extermely dense and highly magnetized. They rotate and emit a beam of electromagnetic radiation which is picked up as radio waves in the form of pulses. The name pulsar is abbreviated from the term "pulsating star". In an interstellar race against time, astronomers have measured the space-time warp in the gravity of a binary star and determined the mass of a neutron star--just before it vanished from view. "By precisely tracking the motion of the pulsar, we were able to measure the gravitational interaction between the two highly compact stars with extreme precision," says Stairs, professor of physics and astronomy at UBC. "These two stars each weigh more than the Sun, but are still over 100 times closer together than the Earth is to the Sun. The resulting extreme gravity causes many remarkable effects." "Through the effects of the immense mutual gravitational pull, the spin axis of the pulsar has now wobbled so much that the beams no longer hit Earth," explains Joeri van Leeuwen, an astrophysicist at the Netherlands Institute for Radio Astronomy, and University of Amsterdam, who led the study. "The pulsar is now all but invisible to even the largest telescopes on Earth. This is the first time such a young pulsar has disappeared through precession. Fortunately this cosmic spinning top is expected to wobble back into view, but it might take as long as 160 years."